The 55-year-old had received a standing ovation opening Sunday's awards show with Grammy's host Alicia Keys, Lady Gaga, Jennifer Lopez and Jada Pinkett Smith. Ms Robinson wrote: "I guess you were a hit at the Grammys." Her daughter responded and asked if her mum had watched. Ms Robinson said she saw it and then asked if her daughter had met "any of the real stars." The pair then quibbled over whether Obama had told her she would be on. 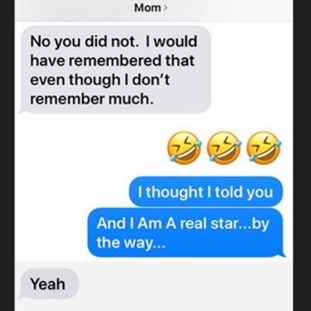 Obama ended the exchange by saying: "And I AM A real star...by the way..."
Obama shared the exchange with the caption, "When your mom doesn’t think you’re a ‘real’ celebrity …"
Since sharing the exchange with the hashtag #TextsFromMom, many have taken to social media to post their conversations with their mum. From funny mum texts to confusion of phone symbols and practical messages, here are some of the messages people have shared under the hashtag #TextsFromMom.